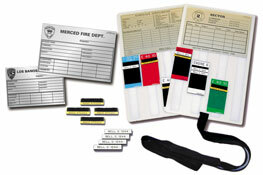 Tacoma Rubber Stamp | Advance Marking and Sign is a licensed manufacturer of the Firefighter Passport™ Accountability System. Developed by the Seattle Fire Department, this system of effective, life-saving tools keeps track of personnel during emergency situations. Our Status Boards, Passports and Name Tags are available in a variety of colors and can be customized at your request. To order, click a product below. You can also download an order form and price list to fax or mail in you order. Need assistance? Contact Jean Knee. She can answer any questions about Firefighter Passport™ Accountability products. 14" x 9" engraved board with destination, divisions, alarms, I.C.S. checklist and space for eight passports. For identifying companies or teams. 4" x 2" plastic with Velcro. Available in rigid or flexible. For identifying companies or teams. 4" x 2" plastic with Velcro. Available in rigid or flexible. Up to 3 lines of custom text. Plastic tag with Velcro back, for use with Passports™. 3/8" x 2", up to 1 line of custom text. Plastic tag with Velcro back, for use with Passports™. 3/8" x 2", up to 2 lines of custom text. Plastic tag with Velcro back, for use with Passports™. 3/8" x 2"
For identifying radios. For use with Passports™ and Name Tags. 5/8" x 2" with Velcro front and back. 1" wide Velcro, sold by yard. 2" wide Velcro, sold by yard. 2" cut Velcro square for use with Passport™ products.